I'll be the first to tell you that this is not the prettiest. It does, however, bring back lots of memories for me - seeing leftover blocks made for other projects. 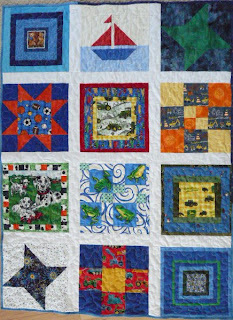 There are some child-captivating and fun novelties used, even if it is not an artistic quilt by any real quilter's standards. It'll keep someone warm and happy. The back is pieced from the last of one of my most sentimental fabrics ever, donated by my sister-in-law (the blue bow fabric). 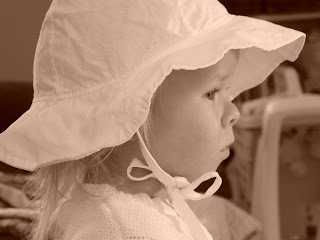 To many it is not so pretty or special, but it symbolizes the love for a child. Here is another that is totally out there. I was on a quest to use as many novelties as possible (like that is not obvious!). It is totally whimsical. I like the whacky Japanese cats and teacups, as well as the crazy pink and green fish. It's like an "I-spy" from another planet. close up... Here's a little frog love. Bright colors, happy-hoppy, froggies. My mother gave me 4 or 5 frog pieces of fabric a year or so ago, and I just got around to using them. FUN! ...and the back, using the remaining frog leftovers. I dipped into the strip box here, making scrappy 12" boy-colored blocks. 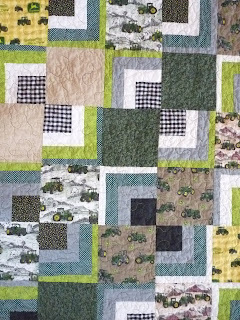 Many use leftover John Deere pieces from a quilt I did earlier this month. I really like the randomness and colors of this one. The back is the lime green. In addition to these, I was also busy finishing off some quilts with blocks donated by the ladies and gent of the Spring Fling Round Robin, which I host. 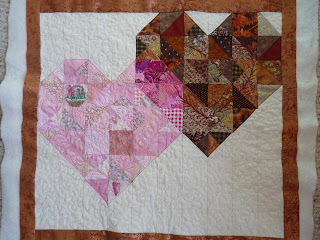 There are seven more donation quilts completed here - There's a slideshow at this link. Now I am onto completing a few birthday blocks for a swap, a piece for the ALQS3, and working on some Bento Box blocks for a quilt in the works. The original Four Seasons Quilt Swap piece that I made for Liliane has yet to arrive, sadly (click on "original" to see the first one I made that is missing). A couple weeks ago, I decided it was time to design a replacement. She chose black as her color of choice...remember that this is a monochromatic quilt swap this session. I could use black & white and shades of gray, plus one accent color, for which she chose lime green. I managed to use all my half decent "shades" of gray on the first quilt. All I had left in my stash were B&W prints. Now, these are pretty decent prints, but not as artsy as the shading can yield. Remember too that I really wanted to send Lil a nice quilt because she did such a fantastic job on a quilt for me recently in the SFRR2. I designed a table runner that is a combination of drunkard's path blocks and a pointier version (added in because I thought that these may take less time to construct). When I designed this in EQ6 I loved the look of the circles and triangles too. Fortunately my stash of bright greens is almost endless. 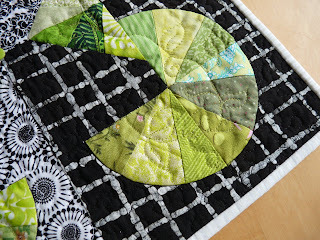 It was fun pulling lots of whimsical limes greens and using them here. The black and white areas are mini-stippled, while I did a spring-leaf free flowing pattern in the green winding area. I'm pretty happy with the quilt overall, and absolutely ecstatic that it has arrived (and after only 5 days - as I mailed on last Thursday). I'm a little sad that I didn't take or feel I had the time to do applique. I really just needed to get a good quilt sent to Lil. I'm feeling better though because she told me she really loves this table runner. Here's the "Sherbet" flimsy, 42" x 52". Call me slow, if you like. But eventually, I do get to working on most of my planned projects. Remember this one? Michelle's blog has moved here, so you can let her know that her donated fabric was not sent to me in vain. I am actually going to finish this quilt!! It just glows in person, and I can hardly wait to quilt it with pink and red variagated thread (yes, later this week I hope). I did vow to myself that I'd spend much of this week outdoors working in my overgrown gardens, but Tuesday has rain in the forecast so I should get a sewing afternoon! I have three Linus quilts that got finished off this week. That was my only rationale for actually cutting this "Sherbet" fabric, and sewing another flimsy. 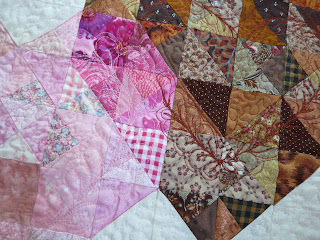 There is one other very scrappy flimsy in the "To be Quilted" pile, which I envision actually finishing soon. With the multitude of grand suggestions on how to "fix" or "forget" my errors on my wedding gift hearts mini, I do have a plan now. large label, binding, bottle of wine (for the forgetting part). Many thanks all of you - I obviously had 10 more readers than I thought I had!! I am making this as a wedding gift for a cousin. It was designed with the intention of being a wall hanging (about 18"x19"). Everything was going along fine, and then I started quilting it. And that's when everything began to come unglued. I don't know if I should try to salvage it or toss it altogether. I have done a pseudo feathered heart. I did the pink first, and am pretty pleased with how this turned out. I marked the brown heart next, changed threads, and proceeded to sew it a little bit wrong (used the wrong heart reference lines). This is likely not noticeable unless you see that the brown heart is a different size. Because I sometimes have minor tension issues, I do the bobbin and top threads the same color. I hadn't anticipated how dark the brown would be on the back. And I really hate it. rip out all brown and redo with brown on top and pink on bottom (and face the tension problems I may have). Please DO comment - I need advice. I'm in a bit of a holding pattern right now. My oldest is off from school this week. Plus, we have a number of doctor, dentist, haircut appts that we are trying to get taken care of. On top of that, I have a nasty sinus infection and my youngest awoke with a 102F fever, and is very clingy today. Joy! I got my Diamonds quilt trimmed and added the outer border. 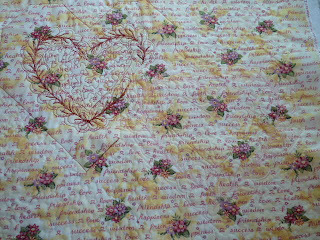 It is ready for quilting, but I am sending this out as it is larger than I like to do on my machine in 1 piece. I'm delighted with how it turned out. It has great color, noce point matchings, and is super girly. Here's one of my April birthday blocks that I just finished. I somehow goofed up and did my May blocks instead of these. 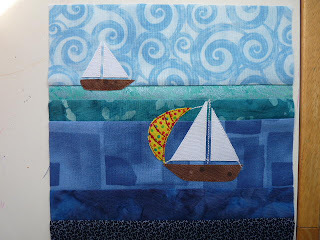 I'm not totally in love with this "By the Sea" block, but it is OK. This flag is for the start of a Yahoo groups round robin. I want a patriotic mini that I can hang during June-July. It won't come back to me for 15 months, but here is the starter 4"x4" (sorta!!) block. 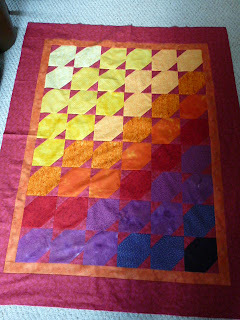 Other things...I have pieced another and the last of the Linus tops from the SFRR3 donated blocks. It still needs quilting. I have even added my 2nd border to the SFRR3 flimsy. That I canot show at all. I'll do a sneak peek in a couple weeks. I remade Lil's (yes, the secret is out) 4SQS5 monochromatic quilt and it will be posted (hopefully to arrive this time) tomorrow. I won't show any pictures yet though so as to keep something secret. It's great though - I'd love to keep it! Rather than post pictures, I am posting links to back postings I have made. These are mostly mini's that I have either made or were made for me in a swap. Either way, they are spectacular little quilts with a great attention to detail, and are worth your second look! 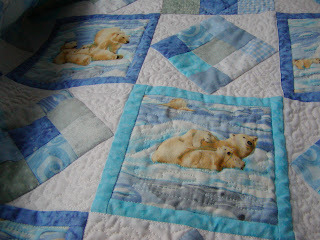 I'd love to have these quilts back again!! 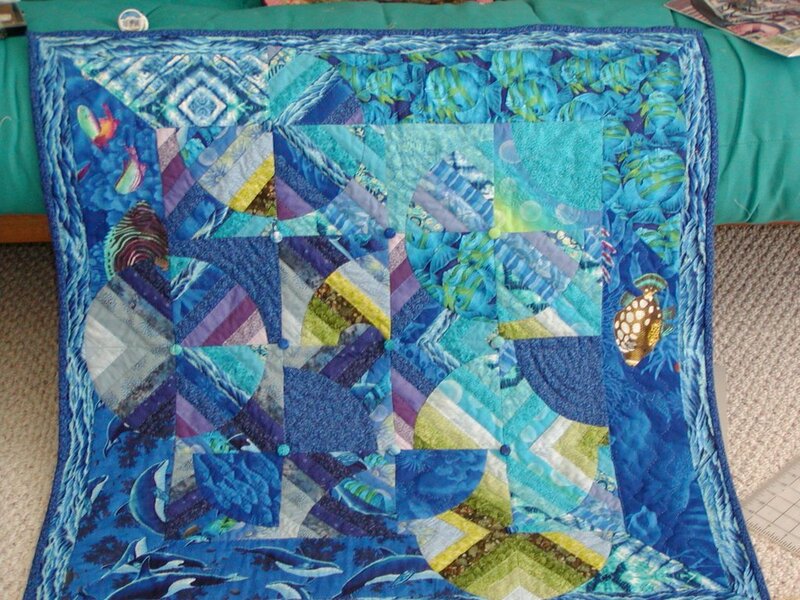 This quilt was made as a part of the Spring Fling Round Robin 2. It lives in my daughter's bedroom. It's fantastic!! 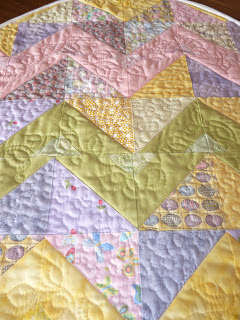 Lil's applique is just gorgeous, as are the bright, girly colors. Made for Emma, this is one of my favorite artys quilts. It combines paper piecing, applique, detailed machine quilting, beading and a sweet Christmassy theme that all people should "Believe". This piece is now in Marlene's house. Made as a part of the Miniature Booty quilt swap, it was hand appliqued and hand quilted. I'd love to have kept this one! Go visit all the sites!! Like some others of you, I had a very hard time selecting just one favorite quilt to post about. I made this 2-3 years ago as a part of my Legacy quilt series. 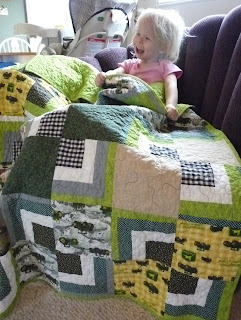 I am making wall quilts for each of my three children so that one day they may have a piece of my passion for quilting. Two of the three are completed and hang in our house. I like to think that my style is traditional with a twist. I love the deep jewel tones, but also appreciate the bolder spotted batiks and less orthadox or conventional designs. 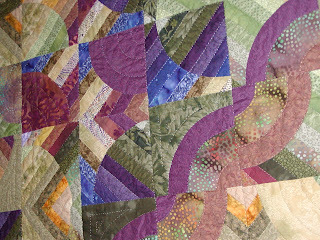 Quilts with intrensic movement intrigue me. 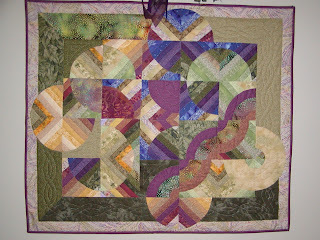 Though I do not own Luisa Smith's Strips-n-Curves book, I did see a segment on a quilt show prior to making this quilt. I had actually made another quilt in this same style the previous year which I totally loved (and gave away), so it was an easy design choice. 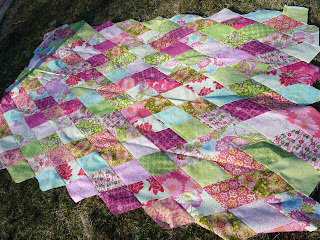 The first step of making this quilt is to assemble about 45 1.5" strips into one large fabric, sewing them side by side. Then, the quarter circles and their mating arcs are cut from this, but at a 45 degree angle. It is a glorious design day to arrange and rearrange these until the desired look is achieved. 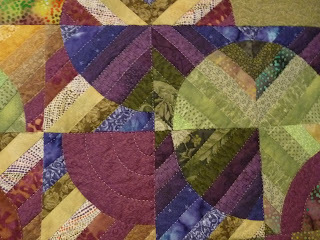 I did a few additional blocks to put in the waving purple stripe, or to add curves that extend into the border. I have no idea which of my children will receive this. I have not afixed labels to the quilts yet. I figured that I'd either let them decide who liked which best as they grow, or I'll select quilts based on personalities. 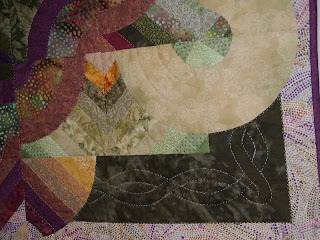 The quilt is completely hand quilted, mostly along the ditches of each strip. 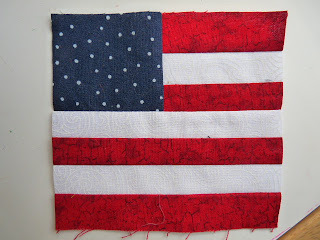 It also has border quilting. (disregard that the picture below still shows marking chalk!! - it was taken before that was removed & I'm too lazy to go snap another shot). 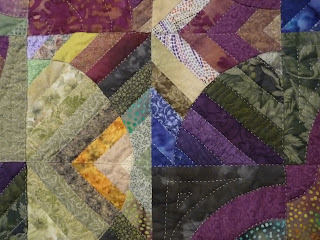 Perhaps you have heard about this online quilt festival being hosted by ParkCityGirl...go have a look! As my readers and fellow swappers know, I am both a rabid quilter and a huge advocate for the children's charity Project Linus. I make generally over 20 quilts per year for this organization. These mostly utilise whatever scraps I have accumulated from my other quilting, swapping or sewing projects. Each year, however, the chapter in my area hosts a quilt show entitled the "Book-Blanket Challenge". Participants must select a children's book, and design a quilt around the story or a character in the story. The books & the quilts are given to children that stay in Barbara Bush Children's Hospital between Thanksgiving & New Years. It is a tremendous gesture, and I warm inside to think how the child who receives one of these must feel afterwards. Generally, the non-Project Linus quilts I make are more design intensive, more intricately quilted, bettern coordinated colorwise, and more pleasing to me. But, this quilt's colors and simplicity make it a personal favorite. 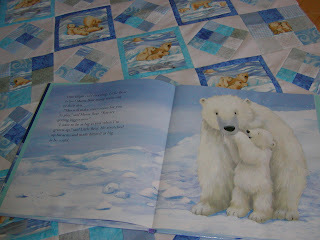 I had under a quarter of a yard of my polar bear feature fabric leftover from making a quilt for one of my sons. In a thrift store, I saw the book, "Big Bear, Little Bear", and I knew this was destined for my donation (the book was in pristine condition!). The book is in the most gorgeous shades of turquoises & blues, and white. I tried to match these colors carefully since they evoked the essence of the Arctic ideally. 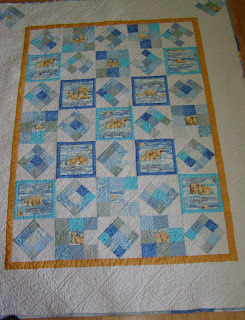 My design is simple: framed fussy-cut bear blocks, alternated with nine-patches, some straight set and some on point. 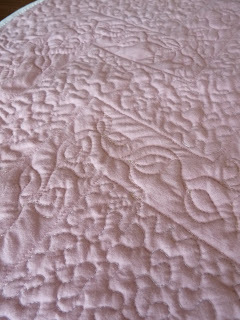 The crispness of this quilt is next to impossible to capture on photograph, especially after it was quilted, but it is both sweet & frosty at the same time. The fussy-cut bears are so totally adorable with a momma bear and a baby bear together. The blues selected remind me of ice, and ocean and sky. 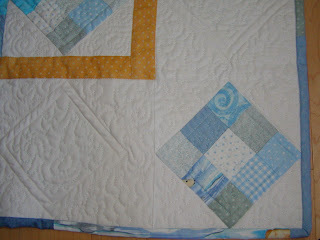 The quilting is done in white and aqua rayon threads which add a light shimmer. The white rayon makes the white Kona resemble ice. Done on my home Singer machine, the quilting was terribly cumbersome for a quilt this size (never again I say!). 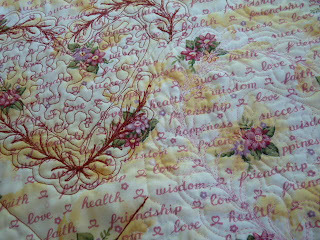 Plus I figured I used three-quarters of a MILE of thread in the quilting alone. My quilt did win this Book-Blanket challenge (2nd year in a row for me), and the kind ladies at the local quilt shop still remind me how much they loved it. I hope I am as in love with my craft in 25 years as they are! I wish I knew which child received this, if only so that they could know how very much I loved making it for them. It has a part of my heart sewn into it. Probably this girl's best friend. I am on the fense about when she will get her dress quilt, as I am learning more about how destructive a 4 year old can be. 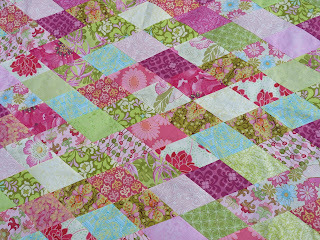 I have whipped up a second quilt in pink and green prints, all very fun and modern. When she gets a twin bed, she will use this. 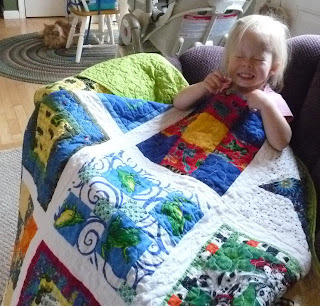 After that, it can be used as a lap quilt or as a secondary blanket on her bed. The diamonds were mildly challenging to get well matched each time (more so that squares), but I think the effect is great. I am adding a yellow border around the entire quilt of soft butter-colored Fairy Frost, and will have this machine quilted somewhere. It is made from many of the new prints I have acquired recently. It also has a dozen or so mixed color Fairy Frosts mixed in for nice textural changes. 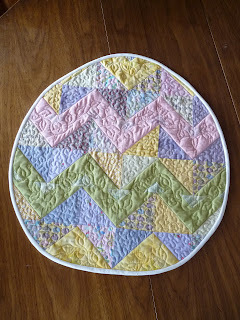 Looking for a great quilty giveaway and a very funny (albeit occasionally off-color which is great by me!) read...check this out. Or (and I realize my posting this decreases my odds of actually winning it...) if you prefer gorgeous fabrics, Amy is offering an awesome 2-yr blogiversary giveaway here. 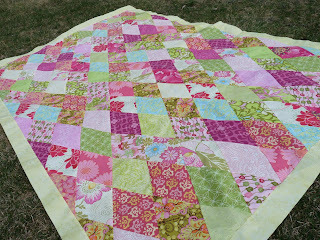 My Spring Fling Round Robin quilters sent the 12 blocks below that were used for this quilt. They actually sent a total of about 70 12" squares, but I am down to assembling the last 2 of 7 quilts from these blocks! 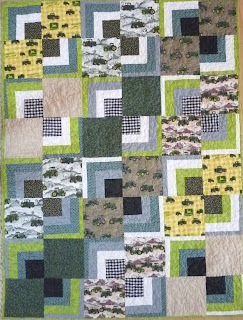 This one is done from a dozen blue and green boyish squares. Tami sent a piece of sweet blue along with her 4 blocks (and another piece of backing I'll likely use for another quilt) that I was able to use for the backing and most of the binding. I actually love the look of a binding scrapped from different pieces of fabric, especially when the quilt itself is somewhat scrappy. It's lovely - has all things boy from John Deere tractors, to boats, frogs, dogs and balls. It's such a great combination of fun boyish things. The next one I called "Nothing Runs Like a Deere". I had acquired a few John Deere fat quarters last year. In my quest to rid my stash of novelties, I put together some half-Bento box blocks using the novelties. 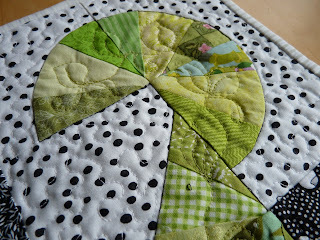 The back of the quilt is the very bright spring green. It reminds me of a field. 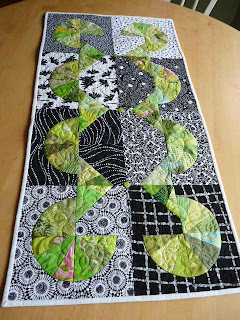 I quilted it in a large meander using a variagated yellow-green thread. Here's a little bit more closer in shot. 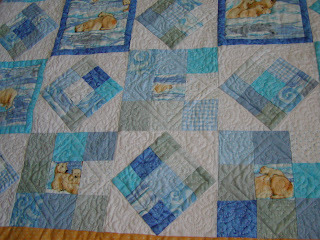 ...and the other quilt too. 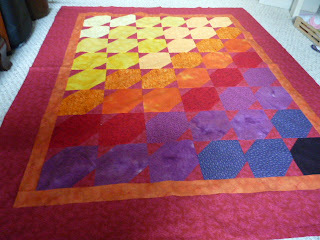 finish quilting on a mini I'm doing for a 2nd cousins wedding. Saturday afternoon we died a few eggs. Yea, I know, that is supposed to be "dyed", bit if felt more like the other. With my 3 kids in those moods of theirs (ages 2.5, almost 5 and just 7), they made it like having a tooth worked on. One just wanted to go out and ride his bike. "Mine's dark enough, I'm done", he'd repeat. He should have just had a few brown eggs and he'd have been content. Middle man just wanted to slosh the colors around and make a mess, as usual. My daughter was the only one truly interested. Once again this year I say, "maybe next year will be more fun!!" 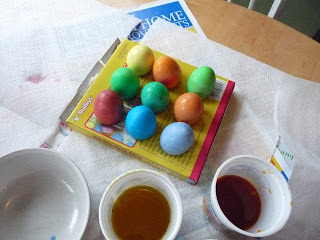 The eggs are now hidden and awaiting the awaking (and hopefully not vomiting) children. My oldest surprised us at 11pm last night puking his guts up in bed. JOY! I have held off showing this since it is a birthday present for someone who I think snoops this blog. The birthday is next week, while she's away in France. So, pending the puking offspring of mine, I will deliver it later today. With my son born on Good Friday, and her bday very close to Easter, it's somewhat fitting. It's hard to give up; I really like it! Last month, I received some great squares from Amy in a spring fat quarter swap. Many were Easter-ish. I never showed a picture on my blog because I stitched half of them into this within days of receiving. Hopefully she can forgive this! Then I added small accents of the Fairy Frosts that Emma sent me to make my Easter egg shimmer. It was so easy - just a bunch of half-square triangles. I drafted a template of an egg, cut to shape and quilted it. The binding is fantastic bias-cut material and sewed on like a dream. I did a springy leaf meander in the solid zig-zags, and a tight meander everywhere else. 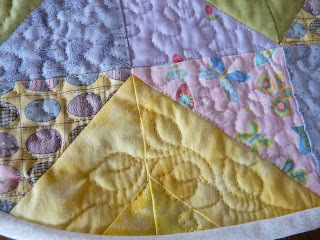 Here's a peek at the back, where more of the quilting is obvious. Hope you have a happy Easter with your family! The last of what I ordered while my husband was away 2 weeks ago has arrived. If www.artquiltsonline.com had not gone under, and they had actually sent BOTH of my orders (at a whopping 50% discount), I might not have gone quite so far over the edge with purchases. 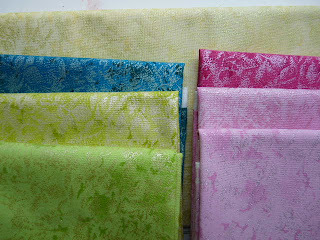 It is dilectable, however, to be sewing with some new and fairly hip fabrics. The pinks above are going into a project O am sewing right now. The Eiffel tower print is for a birthday block, and the Fairy Frosts are mostly because I just LOVE them. I am using a few in a diamond quilt currently on the table, the turquoise is on my last row robin row, and who knows with the rest. I don't have a total plan for this last set, but I always use black & whites, and never have enough, and will probably make another ruffly, layered skirt for Sophie from the bold pinks. 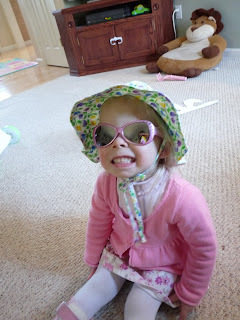 I think I am honing in on a pattern I may use, but I'm considering some of the comments, especially the one from Emma about paring down the # of fabrics. I'm not yet committed to this, but thinking about it. I am also playing with a couple of patterns that mostly use 2" strips as the smallest size so that the patterns of the Kaffe Fassett's will show. This next one is actually one of my favorites. I set the above 12" blocks on point, and stuck just a few red strips in. Any thoughts now that you'd like to share? ?